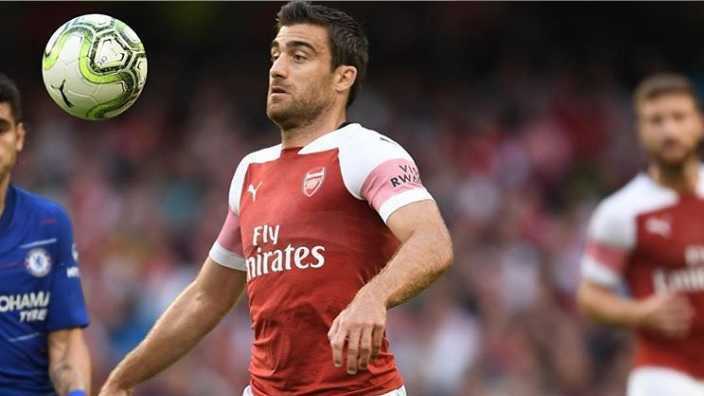 Sokratis Papastathopoulos, professionally known by the name Sokratis is a Greek professional football player who plays for Premier League club, Arsenal and the Greece national team. He plays as a center back. He wears shirt number 5. Previously, he has played club football for AEK Athens and Niki Volou in Greece, Genoa, and Milan in Italy, and Werder Bremen and Borrusia Dortmund in Germany. He was named the 2007-08 Best Greek Young Player. He has won 2010-11 Serie A with Milan, and 2016-17 DFB-Pokal and DFL-Supercup twice in 2013 and 2014. Arsenal center-back Sokratis claimed that sensational striker Pierre-Emerick Aubameyang will hit 30 Premier League goals this season. He stated that Aubameyang is in his best form and is confident that Aubameyang will present himself one of the contenders for the Premier League Golden Boot. Aubameyang has already scored 12 Premier League goals this season and is the current top-scorer in the league. Liverpool's Mohamed Salah and Tottenham's Harry Kane has 11 goals each in the league. Sokratis and Aubameyang were also the former teammates at the German club Borrusia Dortmund. He is the first Greek player ever to play for Borrusia Dortmund and Arsenal. Sokratis Papastathopoulos was born on 9 June 1988. He was born in Kalamata in Greece. He holds Greek nationality. His zodiac sign is Gemini. Information about his parents is currently unavailable. Details about his educational background is also currently unavailable. Sokratis started his youth career from Greek club Aiantas Kalamatas. He then played for Apollon Petalidiou. He then joined the youth system of AEK Athens in 2004. He made his senior debut for the club in October 2005. AEK Athens loaned Sokratis to Greek Second Division club Niki Volou for six months in January 2006. He then returned to AEK Athens for the 2006-07 season. He became the AEK's youngest-ever captain, at the age of 19, in a game against local Athens rivals Panathinaikos in a Superleague match in 2008. Italian Serie A club Genoa signed Sokratis for an undisclosed fee in August 2008. He became the fan favorite at Genoa. Another Italian club, Milan signed Sokratis in July 2010 for 14 million Euro. He returned to Genoa for 13 million Euro in 2011. German club Werder Bremen signed Sokratis on a loan deal in July 2011. The club made his move permanent for 5 million Euro in April 2012. Borrusia Dortmund signed Sokratis for 9.5 million Euro in May 2013 on the eve of the 2013 Champions League Final between the club and Bayern Munich. He won his first title with the club in a 4-2 win over Bayern Munich for the 2013 DFL-Supercup in July 2013. He also won DFL-Supercup for the second consecutive time in 2014. He helped the club to win DFB-Pokal 2016-17 for the first time since 2012. 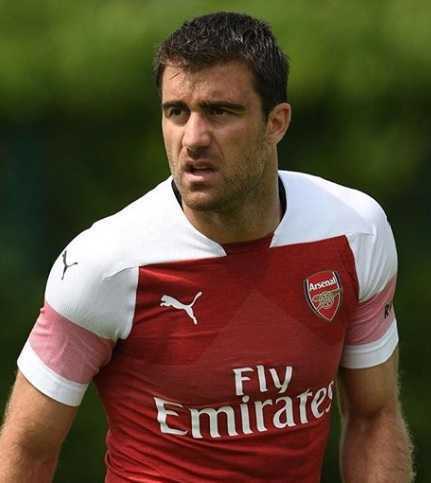 English club Arsenal signed Sokratis for 17.6 million pounds in July 2018. He made his league debut against Manchester City in August 2018. His performance in the 2018-19 UEFA Europa League group stage earned him a place in the UEFA Europa League Team of the Week. Sokratis represented Greece U17, U19, and U21 national teams before making his senior debut in February 2008 against the Czech Republic. However, he was not included in the 23-man squad for the EUFA Euro 2008. He became the first player to be sent off at UEFA Euro 2012 during the opening game of the tournament against co-hosts Poland, where he received two yellows. He also represented Greece at the 2014 FIFA World Cup. He scored his first international goal in the round of 16 fixture against Costa Rica. Sokratis is married to Xanthippi Stamoulaki. They got married in 2014. He has two children. No other information regarding his personal life is currently available. Sokratis stands at a height of 1.86 m i.e. 6 feet and 1 inch tall. He has a body weight of 82 kg. He has an athletic body build. he has dark brown eyes and his hair color is also dark brown. German club Borrusia Dortmund signed him for 9.5 million Euro in 2013. English club Arsenal signed him for 17.6 million pounds in 2018. His net worth is under evaluation. He is the first Greek player ever to play at Dortmund and Arsenal. He was the first player in the 2012 UEFA Euro Cup to be sent off receiving two yellow cards against Poland. German magazine "Kicker" listed Sokratis as one of the est players in the German Bundesliga in January 2017.